I Finally Got Health Insurance! Can you believe it? Only a couple weeks since blogging about how stupid I was too – I’m pretty impressed with myself ;) And also with the site a lot of y’all sent me to: eHealth Insurance! By FAR the best (and quickest) thing I’ve done in quite some time, I was kinda shocked. Especially since the site does come across as kinda spammy, haha… but I assure you it’s definitely not! (I later found out Kiplinger has been ranking it as one of the best insurance websites out there for a while). Originally I had thought “small business” would be the way to go, since a few of my friends had mentioned it worked for them (and also so that the Mrs and I could both get in on it (she’s my proofreader, even though I pay her in hugs ;))), but I quickly came to the conclusion that $1200/mo was WAY over budget. And that was the *cheapest*!! You don’t even wanna know what the highest one was, oh Lord… I guess if you had a lot of employees it would have been a different story, but either way it was a swift “hell no” from the get go. I don’t know how my friends pulled it off cuz that’s just insane-balls. And again, REALLY makes me appreciate what I used to have at my 9-5! After I caught my breath and wiped all the perspiration off my face, I quickly went back and filled out the questions again – but this time chose the “Individual & Family” plan (keeping the Mrs. and I still in it). These results were MUCH much better. Though still a bit to high for what we were looking at. The plans ranged from $400/mo, to well over $1,000 – all depending on what deductibles and coverages you wanted. The one we liked the most was $550/mo, but was still a bit high considering Mrs. BudgetsAreSexy still had the option of going through her school still w/ a fairly decent $150/mo plan. Which ALSO included maternity coverage, which this one did not (I don’t even wanna know how much that woulda put us over – it’s scary going out on your own plan!). Since we’re now back in baby consideration mode, this one’s gonna be pretty important shall the even rise at any point… which could come pretty soon with all that practicing I’ve been doing ;) Bow chicka wha wha! Lastly, I gave the individual plan a shot. And mind you, it’s literally only taken me about 12 minutes to get to this point, having quickly shot down the previous 2 options within minutes of eHealth spitting ’em out for me. It really is that FAST! (I wanna keep stressing that for all you slackers out there just like me — I was pleasantly surprised how awesome/borderline fun it became trying to narrow down the best of the plans for me ;) It became a pretty cool challenge seeing how low I could get it! Haha…). Plan #1 @ $246/mo: CareFirst BlueCross BlueShield PPO – which had always been my favorite plan over the years. This one comes with a $500 deductible, and covers 80% of the costs, leaving me with 20% after. Max out of pocket is $2,500 for the year. Plan #3 @ $292/mo: And lastly, the CareFirst BlueCross BlueShield PPO at 90/10 with a $300 deductible and a $2,500 year max. So if you haven’t guessed it already, I ended up choosing Plan #3. The one that cost almost $300/mo and rated the highest of the plans at eHealth, but the one that’ll also allow me to sleep much much better. And hopefully get me to GO TO THE DOCTORS a lot more when needed, than being afraid of what it’ll cost me (which in itself is huge, cuz I REALLY need to start going in more, and earlier, than waiting until ___ hurts like crazy!). If there’s one thing I’m learning about myself over the years, it’s that I’m getting more and more willing to pay for higher quality when there are bigger stakes in the game. I’m still brand new at all this stuff, so we’ll see what happens over the year, but for now I’m going big and fully protected. I just hope I don’t ever have to prove it’s the right decision! FYI: After you select the plan you want w/ eHealth, you then have to get approved. Sometimes it’s instantaneous right there after submitting it, and others you have to give them more information. Which, for me, happened to be the case. Kinda annoying, but I understand why they have to do it. I had to go back 5 years and try and remember everything that happened – which is HARD since I can hardly remember what went down last WEEK! Haha… but I did my best and listed off a few things like ear aches, broken bones in my feet (rough soccer game) and getting prescribed for A.D.H.D. medicine. Which, oddly enough, they classified as a “Nervous and Medical Condition,” haha… after only taking medicine once? Oh well, I just had to sign a doc saying I either can’t go in for it in 10 months, or prove I haven’t had an absence in coverage for too long… and luckily the later is the case (not that I *need* it to survive, when loads of coffee does the trick!). PS: I know this post sounds like an ad for eHealth Insurance, but I assure you it’s not ;) I just like pimping the products I really really think are awesome – and these guys are one of them. So all links here are affiliates, which means if you end up using them, I get some bones for referring you over. Which is awesome cuz it means you liked them too, and we all win! Instead of doing an individual plan why didnt you just do a joint married plan with the Mrs. employer since it is a cheaper and safer option? Nice work! I definitely agree that a little extra money is worth the piece of mind for these types of things. Keep in mind that you may not be approved. Because of per-existing conditions I can’t find a private insurance plan except through the high-risk pool in my state. @20’s Finances – Thanks :) Yeah, figured we’ll try it out for a year and if I start feeling like I’m paying too much, I’ll see if I can switch to a higher deductible/etc. Wow, this is actually a cheaper option then the insurance I have with my employer! I might check it out. Ease of mine is huge. From personal experience, being a young healthy guy I was thinking about going for a lower policy to save some money. As I recently had shoulder surgery, I’m glad I put the extra money per month into my insurance out of my paycheck as it covered an enormous amount of the surgery costs. Otherwise I would have been stuck with a huge bill I could not afford. @Tim – Hah! Really? Yeah – see what happens? Nothing’s final until you submit it and sign and all that, ya never know. It’s good that you have health insurance. 31 is young, but you’ll soon encounter a host of medical issues…. Sorry to tell you this. When I quit work, I’ll probably get on Mrs. RB40’s plan. WOW. Health insurance plans in the USA are pricey!!!! Do many employers give their employees health insurance benefits? Well done J$! This is necessary – but I am so pleased that in Europe (most of it for most people) we still have national health service (understand mostly free). True, this is bursting at the seams at the mioment in the UK but my guess is it will survive for another five years. After that I’ll come back and look at you post to guide my choice. Went through a similar process when buying Life Insurance, mind. And I wanted to mention that in couple of hours I am going to be on my way to your continent, peeps – going to Atlanta, Georgia for a week or so. It is work but I will find sometime to look around and to visit the house and musium of MLK again. Sorry forgot. Retirebyforty, it is not actually compulsory to have multitude of medical issues in your thirties. I still haven’t had many (well, excluding one related to having a child) and I am of an age when midlife crises should be expected. Have to say that I am touching wood at the moment though. What I am trying to say is that getting a good insurance is for peace of mind and the hope that we don’t have to use it much. Congratulations, J Money! Thanks so much for the props to E Health Insurance. I haven’t looked into them personally, but I have heard about them. I love it when blogs I read review products or services like this, because I know it isn’t just some spammy promotional thing. So thank you again! @Elle @ Odd Cents – Yup! That’s one of the best ways to get insurance cheaper – to go through your employer. It’s when you don’t have one (*ahem*) when you have to go out on your own. Unless you can latch onto your parents’ or spouse’s ;) Or school’s, even. @Maria Nedeva – COOL!! Welcome back to the States my dear :) If I lived nearby I’d make you sneak away for a cup of coffee. And most of us here would LOVE to have national healthcare :( Most people don’t, ofcourse too, but man – we have sooooooo many people dying and sick and not getting help cuz of the way it’s set up here. Really really sad, on a purely human level. J – I don’t buy your “sleep better” logic for choosing a high premium, low deductible plan. 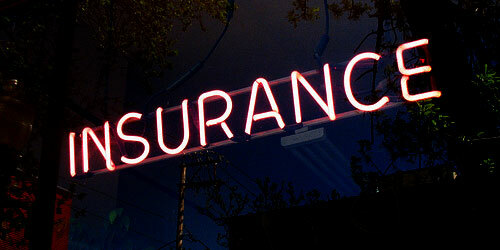 You should insure against major loss events and self insure the rest. That’s what real personal finance is about. If “sleep better” was that important, you wouldn’t have gone so long without any insurance at all. The best of both worlds is a high deductible, HSA eligible plan. Did you even investigate those? An HSA is the best retirement investment vehicle ever created – no taxes in, no taxes out. You should reconsider this move. Just as financial companies rely on “credit reports” to establish credit for customers, insurance companies utilize “medical reports” to assess the health, determine the insurability, and set the price for insurance applicants and policyholders. Few consumers realize that the Medical Information Bureau Inc. (MIB), Ingenix Inc. and Milliman Inc. have personal medical report files on them. Like the credit-reporting agencies Experian, TransUnion, and Equifax, these “nationwide specialty consumer reporting agencies” monitor virtually every aspect of a person’s life. Remember, the new health care reform laws in the Patient Protection and Affordable Care Act don’t go in effect until 2014! All insurance applicants and policyholders should order an annual copy of their “medical reports” from the three nationwide specialty consumer reporting agencies to ensure they aren’t overpaying for insurance or in danger of policy rejection or rescission for reported pre-existing conditions or errors. P.S. My insurance just went up to $419 a month. You better buy me dinner at the Financial Blogger Conference — and yeah, I *do* want it SuperSized, buddy. That’s awesome that you finally have health insurance again; it must be nice to not worry. I’ve checked out eHealth Insurance before and loved it, so many options and sortable—they def. have a great site. I still don’t have any yet. :-( I just can’t really afford an extra few (or more) hundred bucks each month right now on just my honey’s income. One day…..
@ML – I can’t tell if that’s spam or not? @Elle – Guess there’s pros and cons to living in all countries, eh? Previous post: I Paid 25 Cents For The Toilet And I Liked it.